See to the right for tryout dates. Tryouts will be in April with team workouts starting in the summer at the coaching staff's discretion. The Armstrong Arrows National Bound Program is based and operated from The Belmont Complex located at 415 Butler Rd. Kittanning, PA 16201. Ice practices to begin in July at Pittsburgh Ice Arena. Regular season ice practices will be moved to the Belmont Complex in August. National Bound Teams will have 2 ice practices per week (set weekday practice schedule after season begins). “National Bound” Teams are High School Friendly. Players are permitted to miss practice for High School Games. Players are expected to attend the “National Bound” practices if there are any other conflicts in schedule such as practice. Approximately 45 - 50 games (Teams could participate in more games) including: PAHL, Tournaments/Showcases, Independent Games (“National Bound” Coordinator will select Tournaments/Showcases and Independent Games for each “National Bound” Team), Mid Am State Playoffs if eligible. Armstrong Arrows "National Bound" Teams are required to wear navy blue helmets and navy blue gloves. Player uniforms also consist of home / away jerseys, socks, and shell. 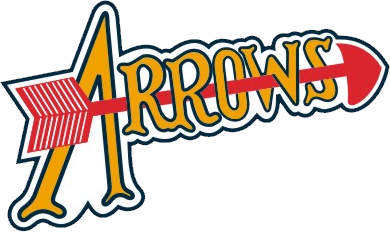 Each player will be required and responsible for the purchase and care of their Arrows uniform. Costs associated with their uniform are not included in the season fee. National Bound Players will receive a team issued hockey bag and practice jersey at no additional cost. All payments will be made online through the online registration via a scheduled payment schedule. A pay in full option will be available as well as a payment plan option. Also, please see the pane on the right under fees. Follow the "Resources" tab and then to the "For Coaches" tab for more info in the National Bound Coaching Staff. Players must be registered with AAHL online and pay commitment fee. Online Registration open 4-1-19. Please arrive at least 45 minutes prior to tryout start time. Bring a white and dark jersey (black / blue – Jerseys should be plain with no names), you will sign in and get an AAHL tryout number for your player. At this time, we will also be verifying that registration has been completed. Player placement will be announced on the AAHL website shortly after the last tryout date for each team. You will have 24 hours, after notification, to decline placement on a team. After the deadline, your commitment fee is non-refundable. The Commitment Fee is non-refundable once team placement is accepted. If you decline placement on a team in the stated timeframe, your commitment fee will be reimbursed. Players will not be allowed to skate in the tryout unless they have paid the commitment Fee. No Exceptions! AAHL reserves the right to hold supplemental tryouts to fill any & all open roster positions post open tryouts. Please review "Events" / "Tryouts 2019 - 2020 Season" For additional tryout and team placement information. AAHL will adhere to all policies of USA Hockey and Mid Am in regards to tryout dates. Skaters: $500 (Due at time of registration). Goalies: $500 (Due after accepting position on a team). U14 / U16 Forward / Defense : $2500 + $500 in mandatory fundraising. (Payment options available). U14 / U16 Goalie : $500 + $500 in mandatory fundraising. (Payment options available). Note - All registrations and payments must be made through the AAHL online registration with the exception of the mandatory fundraising fee, which will be collected by the team at a later date, it is not included in the registration or season dues. Each player will receive (50) $10.00 cash/gun raffle tickets to be sold as the teams mandatory fundraiser. Each player in the AAHL is also responsible for Kitchen Duty at the Belmont Complex ($210 Buyout). Please see Policies for Kitchen Duty information. AAHL does provide additional fundraising opportunities to assist in financing. AAHL will make a placement recommendation, but the PAHL determines the final placement of ALL teams in the league. AAHL cannot guarantee the level of play for any team playing in PAHL.